Disney's Frozen is coming to messaging apps in sticker form. The animated blockbuster has been merchandised, advertised, digitized—and now there's a licensing deal to bring the characters to apps like BlackBerry Messenger and Kik. The licensing company TextPride, which buys rights to branded virtual goods, added Frozen to its portfolio, Adweek has learned. "We have a deal with Disney Publishing and access to a lot of exclusive Frozen art," said Sean O'Brien, co-founder and CEO of TextPride. "Disney is all about telling stories and stickers was a great way to get a whole new conversation [started] about one of the biggest animated films ever." New York-based TextPride announced a load of new entertainment brands for which it would develop virtual stickers, including Pixar's Toy Story, MGM, Hearst and Sega. The Frozen content is set to sell on BlackBerry Messenger next week, and launch on the other apps later, O'Brien said. Branded stickers are becoming a big moneymaker for messaging apps where users buy them to share with friends while texting. For instance, Line, a messaging app that is big in Japan, generated $338 million in 2013, and 20 percent of its money came from selling stickers. This year, BlackBerry pursued a messaging strategy more aggressively with a revamped app that allows brands to publish content and sell stickers. TextPride, founded in 2012, has amassed a deep catalog of branded content and deals with messaging apps to distribute the virtual goods to more than a billion users, according to the company. It has licensing deals with Miramax for Pulp Fiction, Reservoir Dogs and Kill Bill; deals with sports teams and broadcast networks; and deals with Web favorites like Dumb Ways to Die. 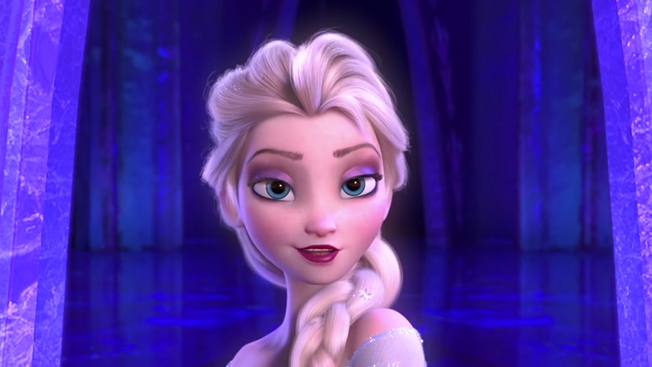 Frozen is the fifth-highest grossing movie of all time, so far, taking in about $1.3 billion. As any parent knows, children have embraced the movie and its characters with almost scary cult-like devotion. Almost everything associated with the movie has been a monster hit, especially the song Let It Go by Idina Menzel. Toy Story, the franchise out of Pixar, also is owned by Disney, and was included in the latest licensing deal. TextPride, participating brands and apps share the money from sticker sales. Toy Story content already is available on BlackBerry's apps and are No. 1 in the store, O'Brien said. "The affinity is clear when it comes to these kinds of properties," he said.